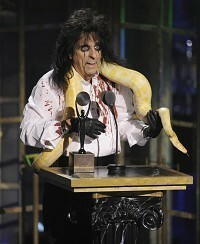 Alice Cooper came into the Rock and Roll Hall of Fame with a friend - a boa constrictor. The theatrical rock band with a lead singer who takes the same name has been inducted into the Hall of Fame. His class includes New Orleans piano maestro Dr John, Tom Waits, Neil Diamond, Darlene Love and Leon Russell. Cooper wore a blood-splattered shirt and also brought school children along to sing School's Out. It all seemed appropriate for a band that inductor Rob Zombie said invented the rock show. Alice said: "We've always been a hard rock band. We just wanted to decorate it a little differently." The work by the inducted artists will be celebrated in perpetuity at the Rock and Roll Hall of Fame and Museum in Cleveland. New Orleans piano maestro Dr John wore a bright purple suit for his induction. Singer Darlene Love, whose voice cut through Phil Spector's Wall of Sound, called her induction into the Hall her best 70th birthday present. Pianist Leon Russell was also inducted at a black-tie dinner at The Waldorf-Astoria hotel in Manhattan. Bob Dylan, who became famous for his anti-war songs during the Vietnam War, is set to perform in the Communist country for the first time. The Classical Brits are to undergo a revamp to score a broader audience - dropping the word "classical" from the title. Justin Bieber reportedly spent a night sleeping on his tour bus after two fans managed to sneak into his hotel room, dressed as cleaners.